Reprint. Originally published: London: Orion Children's Books, 2011. 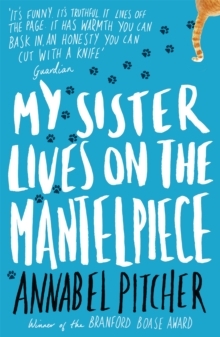 Winner of the 2012 Branford Boase Award, this is Annabel Pitcher's stunning debut about ten-year-old Jamie, and the way his life and his family are shaped by the sister in an urn on the mantelpiece. Five years ago, Jamie's sister, Rose, was blown up by a terrorist bomb. His family is torn apart by their grief. His mum runs away. His dad turns to drink and hate. Rose's surviving twin sister Jasmine stops eating, gets piercings and dyes her hair pink - anything to look different to her twin. But Jamie hasn't cried in all that time. To him, Rose is just a distant memory. Jamie is far more interested in his cat, Roger, his Spiderman T-shirt, and his deep longing and unshakeable belief that his Mum will come back to the family she walked out on months ago. But moving away for a Fresh New Start introduces Jamie to something else very interesting - a girl named Sunya. Sunya is bright, exciting and fun, and the one person at school he can call a friend. But how far can this new friendship grow when Jamie is desperate that his dad doesn't find out?